Okay so this is going to be quite a long one as I’ve been to a lot of places and done a lot of things since that last blog post from Hue about a week ago. 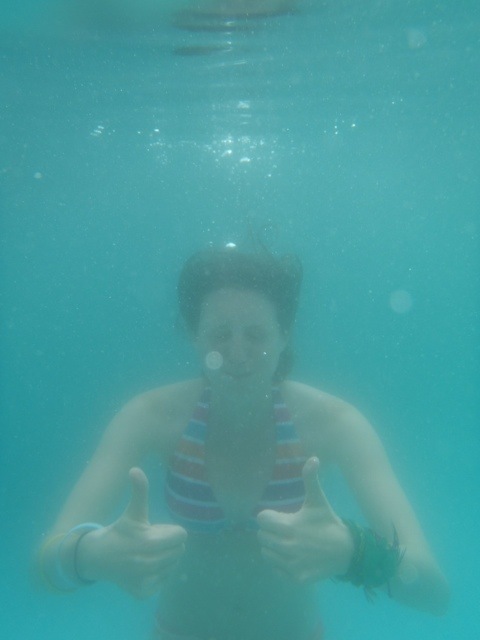 Sorry for the lack of updates but I’ve just been having too much fun in the sun! So where do I start? Hue, midway down the Vietnamese coastline was where I left off so let’s begin there. We arrived early in the morning and after finding our hotel (the lovely Valentine Hotel) and settling in we headed out for food as it had been quite a long bus ride without much food. For the rest of the day we just chilled…slept, skyped, emailed and caught up with a few things and people we’d been neglecting a bit. The following day thought we went on a tour of the city, taking in various sights such as the old citadel, some tombs and even a conical hat and incense making village which was pretty sweet. The only downside to the day was the rain. And I don’t just mean a little drizzle. This was full on, soak-you-in-a-second, Camp Sloane style rain! It was fun for a while but it got old pretty quickly, especially as it mean the boat part of our tour got cancelled. But oh well, such is life. To make up for the miserable day we went out for a delicious dinner at a place called Golden Rice (almost as tasty as the night before at Missy Roo’s Bar), where they gave us some ridiculous raincoats to run home in as it was still bucketing down when we left. 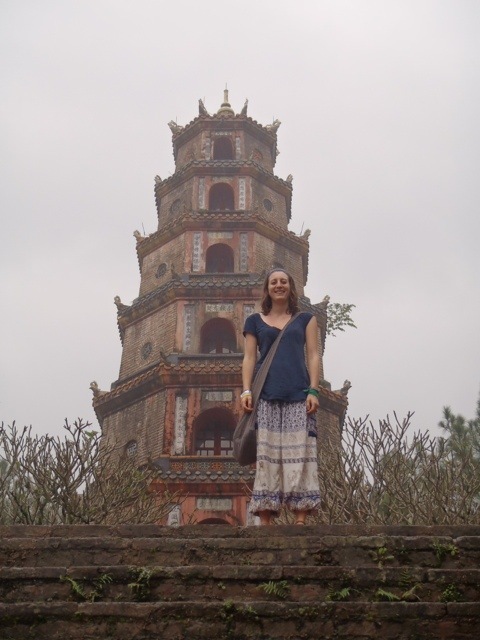 So that was Hue…not my favourite place (the rain didn’t help), but there are a few cool things to do there if you’re up for it. Next it was onto another bus for a short 5 hour ride to Hoi An, where we were really hoping the sun would come out so we could start tanning again…the rubbish weather since we entered Vietnam was really doing us no favours! Hoi An greeted us with yet more grey skies, a very disheartening sight when our hopes for sunshine had been so high. But once we saw our accommodation, the wonderful Sunflower Hotel, we felt a little better…I mean, when someone goes to the trouble of putting flower petals on your (double) bed, you can’t help but smile. And the next day things just kept getting better. 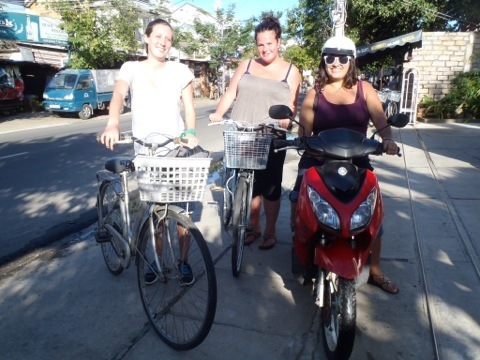 We rented bicycles (and a moped for Maritza) and headed for the beach, just a short 5k ride away. As we were pedaling the sun broke free from its cloudy shackles and shone down on us, with a glorious heat, just in time for some lazy (and very happy) sunbathing on the beach for a few blissful hours. Blissful that is until we realised that our lack of sunscreen may have possibly given us (ahem me and Rosa) a little teeny weeny bit of a sunburn…whoops. We arrived in Nha Trang at about 6am the next morning, after a fairly comfortable 12 hour overnight journey. Upon arriving at our hotel (the Ruby Hotel) we pretty much just crashed out until about midday, when we headed out for a delicious lunch and some more beach times…my opinion of Vietnam was slowly changing at this point – I can’t resist the beach and a bit of sunshine! Once the sun had set it was time for dinner, and we found this great little Italian place called Good Morning Vietnam, just up the street from our hotel. Then it was time for an early night, as we had to get another bus at 8am the next morning…moving pretty fast, I know, but we’re trying to get to the Thai Islands as early as possible so we actually get to spend some proper time on them and just chill out in one place for a little bit. 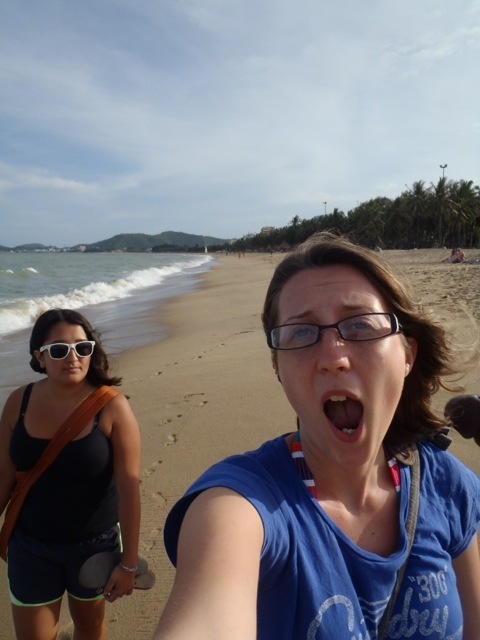 So it was on to Mui Ne next, a sleepy little beachside town, about midway between Nha Trang and Ho Chi Minh City. This has to be by far my favorite place we’ve visited in Vietnam…it reminded me a lot of my uni town, Falmouth in Cornwall, with its friendly atmosphere, little bars and restaurants, and beautiful views. After a bit of deliberation we found ourselves checking into a gorgeous resort called Bien Nho, Sea of Memory, set right on the beach front, with an amazing pool, room and service…I was in absolute heaven. And it just kept getting better. The next day we hired a jeep (and a driver) and headed on a tour of the surrounding area, which took us to a place called the Fairy Stream (a shallow river that runs through stunning red and white rock-sand), a fishing village, the yellow sandunes and, most importantly, the white sandunes, where we rented quad bikes and plastic slides and drove around the dunes having the time of our lives…the funniest thing was when we tried to use said slides to slide (duh) down the dunes and were completely unsuccessful as either the plastic wasn’t waxed properly, or the sand was too dense, or both. But it was funny nonetheless. 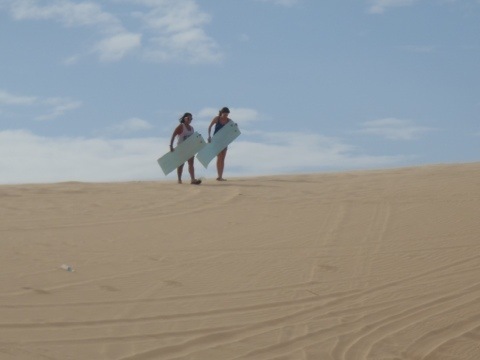 Oh and we got the quad bikes stuck in the deep sand quite a few times too…video to come I promise! I could have stayed there all day, but alas, it was time to leave and we had to forgo the dunes for our resort and siping milkshakes by the pool under the setting sun…it’s a hard life, isn’t it? After two glorious days and nights in Mui Ne (the second of which saw us enjoy a delicious dinner of fresh fish, shrimp and crab and a local restaurant), we reluctantly said goodbye to perhaps my favourite place on this trip so far and boarded yet another bus, this time headed for the capital city, Ho Chi Minh City (HCMC), where we arrived last night. And this brings us to today…we spent the morning drinking coffee and watching a (free) movie in the upstairs movie lounge room of Bobby Brewers Coffee Shop, before heading out on our own walking tour of the city, taking in such sights as the Ben Thanh Market, the Notre Dame Cathedral (nothing like the real one) and the Presidential Palace, which is a weird mix of 80s decor with more exquisite furnishings. Then we returned to our favorite place for another movie with our dinner (a much needed American Burger)…the perfect way to end our stay in the hectic, noisy, beautiful Vietnam. Tomorrow it’s on to Cambodia for a complete change of pace and a whole new set of quirks and social etiquettes to learn. your picture is great. Thanks you about this good information.